Oh what a treat this meal was! I was dreaming of a sweet and salty chicken dish, and this came together in my mind. I bought good quality turkey bacon which came in thick slices and made the dish that much more hearty. Hope you enjoyed it as much as I did. Season the chicken breasts with pepper and garlic salt. Wrap two pieces of turkey bacon around each chicken breast. Bake at 375 degrees about 30 minutes, until chicken cooked through. While the chicken is baking, caramelize the onions. Put the olive oil in a sauté pan and heat on medium for 1 minute. Add the onion rounds and sauté for 2 minutes. Add the 2 tbsp. water and honey to the onions and cover. Let simmer of medium-low heat, periodically stirring. Simmer onions for about 15-20 minutes, until soft and brown (caramelized). 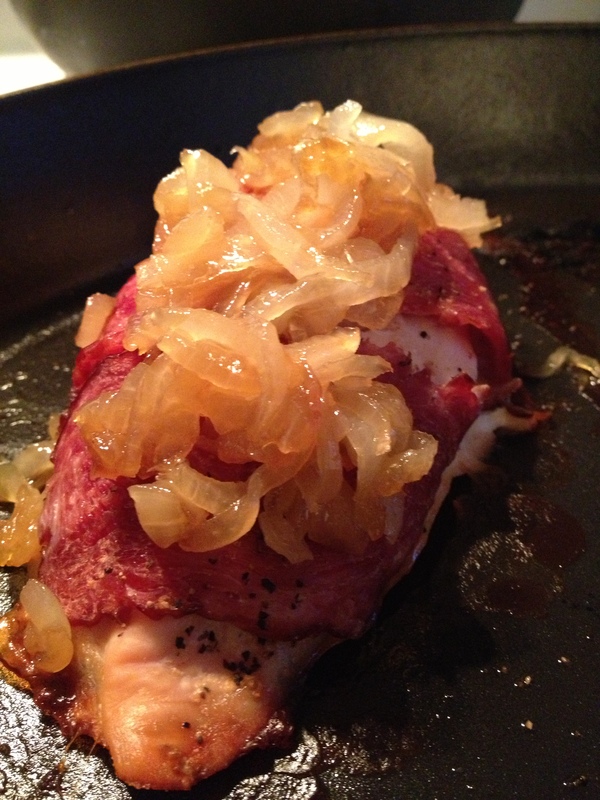 Place caramelized onions on top of cooked chicken and serve hot! I recently made a huge diet discovery… my body can tolerate goat cheese! There is some “guess and check” when it comes to having food allergies and discovering what your body can and cannot tolerate. Having a dairy allergy means that I avoid dairy, but goat milk is not often considered a traditional “dairy” in our diet. So, I did some “guess and check” and tried goat cheese on a salad… no reaction. Just to be sure, I tried it again and still had success! This has re-opened several foods to me and I am eager to see what I can do with this rediscovered food. To celebrate, my mom made a pasta side dish with goat cheese on top (among other wonderful flavors). With this pasta base, there are so many possibilities… pair it with fish (as we did), chicken, pork, or even as a cold pasta salad. The flavors are bold and delicious! While the pasta is cooking, chop the onion. Add it to a saute pan with the olive oil, sugar, salt, and pepper. Put over low heat, stirring until it caramelizes. Toast the chopped walnuts in another saute pan, just for a few minutes over low heat. Just to bring out some flavor. When the pasta is done cooking and is drained, add the reserved pasta water, caramelized onion, chopped red pepper, toasted walnuts, and crushed red pepper. Fold to combine. Plate the pasta, and add the parsley, lemon zest, and goat cheese on top. 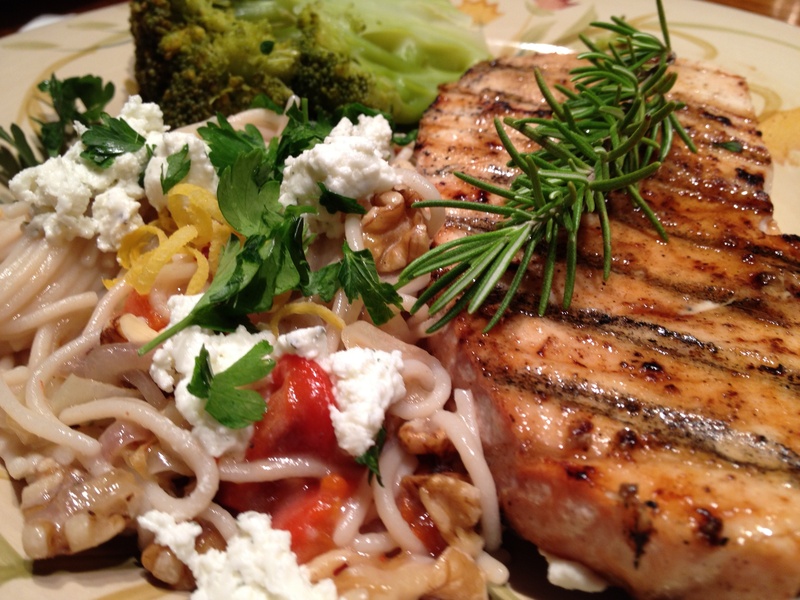 Garnish with rosemary and plate with your favorite protein!